Questions: why this rainforests in particular? Las Piedras is the last stretch of intact rainforest left in Peru. It is part of the largest biodiversity hotspot on the planet and also a part of the Andes Biodiversity Hotspot. But is completely unprotected land. This means that illegal loggers can log and not get caught--native communities are taken advantage of as illegal activity moves inward surrounding their lands. Uncontacted tribes still occupy Alto Purus National Park in Las Piedras, but outside pressures are causing them to lose land and resources, especially their food source. Las Piedras and the greater Madre de Dios region as a whole - is the last hope for conserving the entire pristine Southern Peruvian Amazon. It connects three surrounding national parks, which are patrolled and regulated. If we can protect what’s in between, then all three parks are also more protected and wildlife can travel between them safety. Las Piedras is their last hope, and we as a nonprofit serve as its last hope. It is a large area and river - over 64 communities just on one side, but we feel confident that we can steer it in the right direction given the support. It is impossible to say that one entity can take on the world but a small piece of it, with the right team and resources, can do anything!! What are you most excited about sharing with guests, September 20th? Ah! 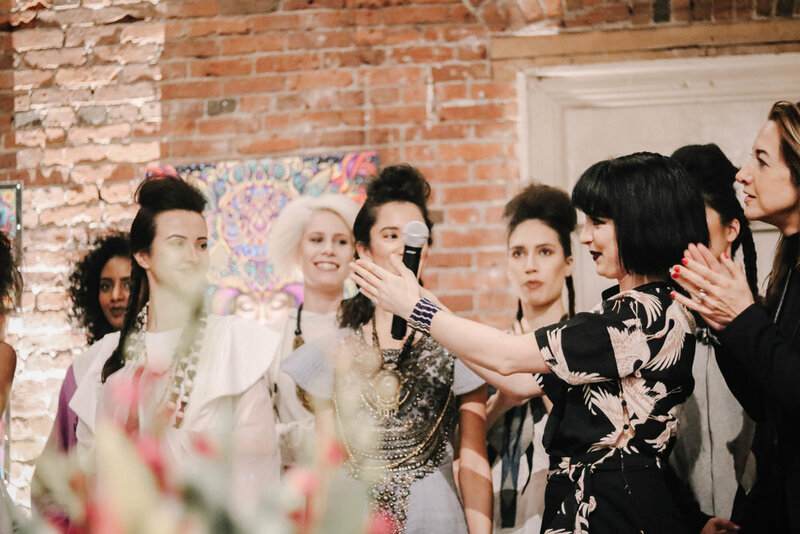 So much it’s hard to decided...the core of the event is of course the fashion show, we have 6 rainforest inspired collections by designers who are as passionate and inspired by the rainforests as our team is. Each are so unique—ranging from dramatic avant-garde couture by Kalikas Amour who was in our debut of #RainforestRunway during this past London Fashion Week show to gorgeous structural dresses resemblance of the Monarch Butterfly by local designer Luly Yang and then to the adorable colorful jungle-floral kids line by Poleras de Agus embroidered and made by women in Cusco, Peru. Of course what excites me MOST is the only thing that will actually be a surprise for our team too which is seeing how the audience dresses up and interacts with everything we’ve created for them over the past year and a half! What have previous years been like and how is this one different? In previous seasons, we have shared animal and rainforest-inspired collections from as many as 18 international designers and hosted between 500-800 guests each time...this year is much more intimate with only 300 guests so we can give each a more intimate experience-each guest is a VIP this year. It’s also the first time ever that we’ve done a full sit down meal! It’s going to be epic, who doesn't love an open Ceviche bar!?? 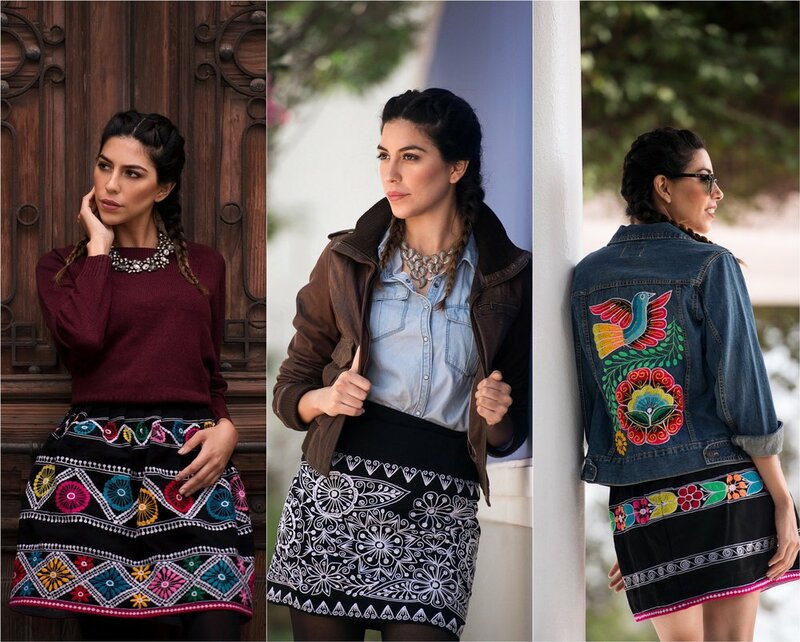 What’s the relationship between Hoja Nueva and Fashion for Conservation? 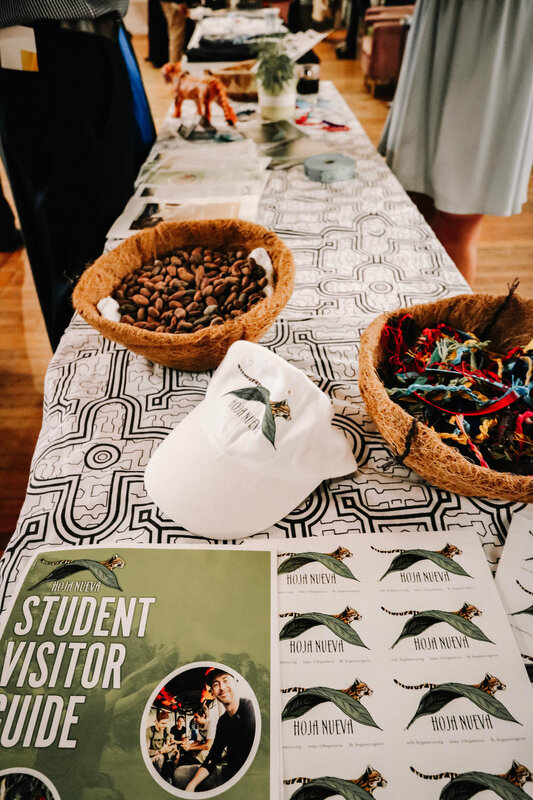 For each Fashion for Conservation campaign, we partner with a grassroots on the ground non profit where we can physically go and visit to connect with their mission and work. What’s unique about hoja however is that most of our team members are shared. Our co-founder Samantha Zwicker and myself are both co-founders and directors at Hoja Nueva. The jungle there is home for both of us. Sam is there sometimes up to 9/10 months, each year my time extends there too—I went for the first time only for a few weeks, now I don’t like going for any less than two/three months. It’s our heaven on earth. That’s really why we continue to do an annual gala with hoja, we are now in our fourth year! Hoja Nueva is a small grassroots organization and 501(c)(3) charity with a small predominantly volunteer driven team driving conservation impact much greater than seemingly possible in the lower Amazon region of Madre de Dios, Peru. A few projects I’ve personally got to be part of include RE-introducing orphaned wildlife to the rainforest whose mothers have been illegally trafficked or killed by loggers and were able to be rescued from a similar fate, supporting alternative income opportunities to local communities via micro financing and mobilizing volunteers for hands on labor (examples: sustainable cacao production, indigenous artisan program and Brazil nut harvesting), and of course physically protecting/buying/monitoring land. Hoja Nueva navigates a whole lot more too, that’s just the start. How can we help? / Get involved? What You're Really In For...September 20th!! We are rapidly approaching fall season, and with fall comes the lovely month of September, the month of our Rainforest Gala and runway! We are so excited to welcome back talented artists, musicians, and performers to compliment our runway presentation. Are you ready to be apart of our celebration of conservation and sustainable fashion? We would love to have you. 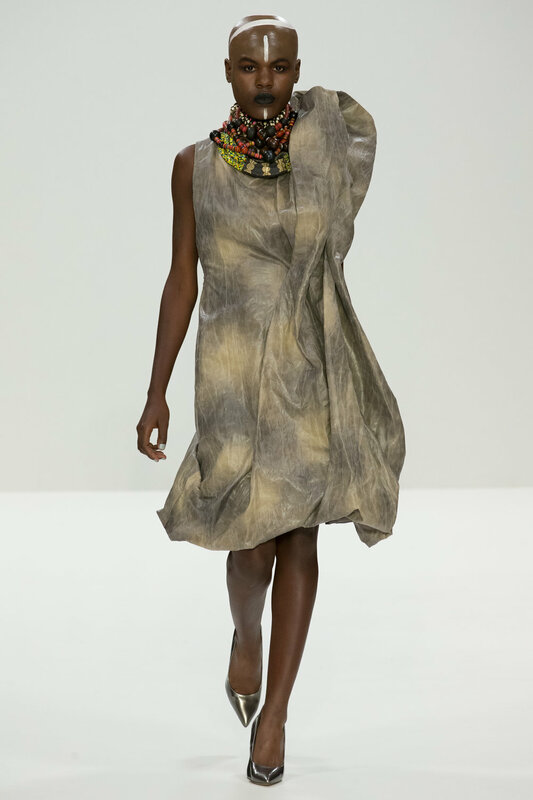 Dress from last year's annual fundraiser for Hoja Nueva inspired by the organisation's sustainably grown cacao. Design by JOSÉ ZAFRA. Thursday, September 20, 2018 at Seattle's newest and most sophisticated private event venue (Block 41), Fashion for Conservation and Hoja Nueva will bring a limited number of guests on a walk through the rainforest in style; witness this exquisite one night only celebration with diverse flavors and cultures, captivating sounds of the wild, and vibrant designs inspired by rainforests. Help us create a space where diverse peoples can share and celebrate their unique stories and experiences living in harmony with wildlife and their habitats. This event funds rainforest conservation, wildlife rehabilitation, and sustainable agriculture with Seattle US 501(c)(3) and Peru based nonprofit Hoja Nueva (hojanueva.org). Seattle's 4th Annual Rainforest Gala & Runway will host only 300 guests, so make a reservation for you or your table party, before its too late! The urgency of conserving the earth's rainforests now goes beyond cultural and wildlife preservation. Fragmented forests resulting from increased agriculture store less carbon and adversely impact wildlife movement and gene flow, resulting in higher levels of atmospheric carbon and regional species declines. As a component of the recent Paris Accord, slowing climate change by method of conserving rainforest is an urgent matter that requires strong institutional support for projects that shift how we source our food, water and energy, and support for rainforest conservation and habitat protection. Hoja Nueva confronts deforestation in the Peruvian Amazon by conserving rainforest and building capacity within remote and indigenous communities by developing micro-finance programs and empowering women; implementing rigorous scientific research in waste management, water and wildlife; and creating alternative income opportunities that protect indigenous culture andwildlife habitat. 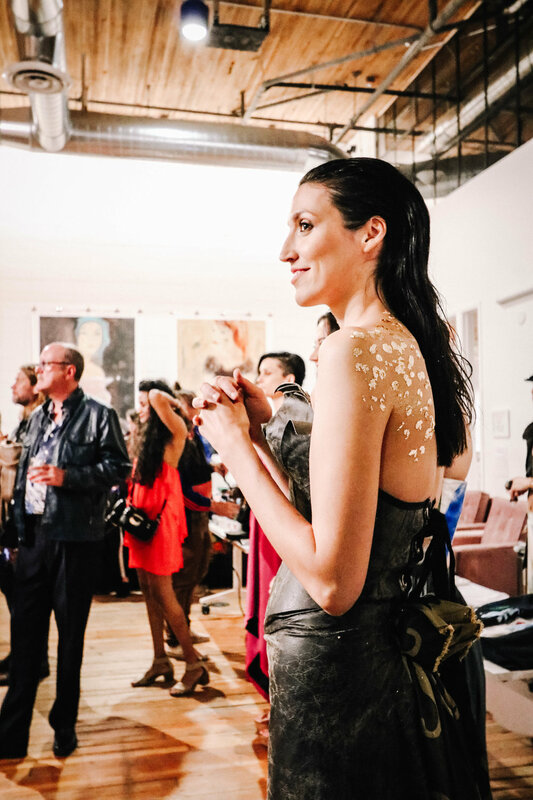 "Thanks to last year's rainforest gala, our zero-carbon footprint eco-lodge has been built in the lowland Amazon rainforest along with 2000 trees to create a research center that provides conservation and agroforestry education in a world threatened by rampant deforestation and climate change," states co-founder of Fashion for Conservation and Hoja Nueva director Samantha Zwicker. Mark your calendars for this wild event and stay tuned for the full lineup! Tickets are extremely limited - get them before they're gone! 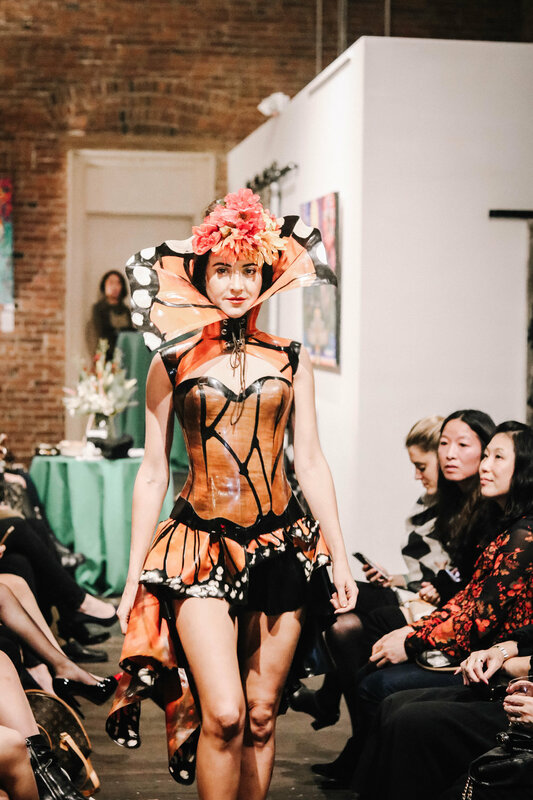 10 Reasons Why NOT TO MISS Seattle’s 4th Annual Rainforest Gala & Runway! - WALK ON THE WILD SIDE. Take a walk through the jungle in high style! Learn about ecosystems, wildlife and culture of the Amazon through fashion, music, presentations and visual art! TWO lucky guests will also have the opportunity to WALK THE WILD RUNWAY. - FOODIES PARADISE. Three course mouthwatering Peruvian style dinner with an exquisite sweet ending prepared by a top local dessert chef behind “Seattle’s Hottest New Restaurant,” 2120! *GF/Vegetarian available by request. - FALL IN LOVE. You never know what may happen when you meet your significant other (or future wife!) on the wild side...take your date home with plans for an exotic 7-day jungle get-away that you won in the live auction! - BE INSPIRED: “After last year’s gala....I was speechless with tears in my eyes! The dance performances, designs and diversity of the audience moved me so much, like it awakened something in me, I felt so at home, and so inspired!” - Cayetana San Segundo (now part of our team of passionate volunteers, dedicated to creating a once in a lifetime experience for YOU again this Rainforest Gala). - MEET ANTHAR KHARANA FROM COLUMBIA. Anthar Kharana will be sharing the power of traditional songs used in different ceremonies of the Americas to comnect us with the spirit world..
- SUPPORT INDIGENOUS WOMEN. All gala guests will receive a special gift from one of artisan women we are working along side in Peru. The evening will help fund alternative income opportunities that support women of YINE and Ashaninka lineages in continuing to live in harmony with their land and community. 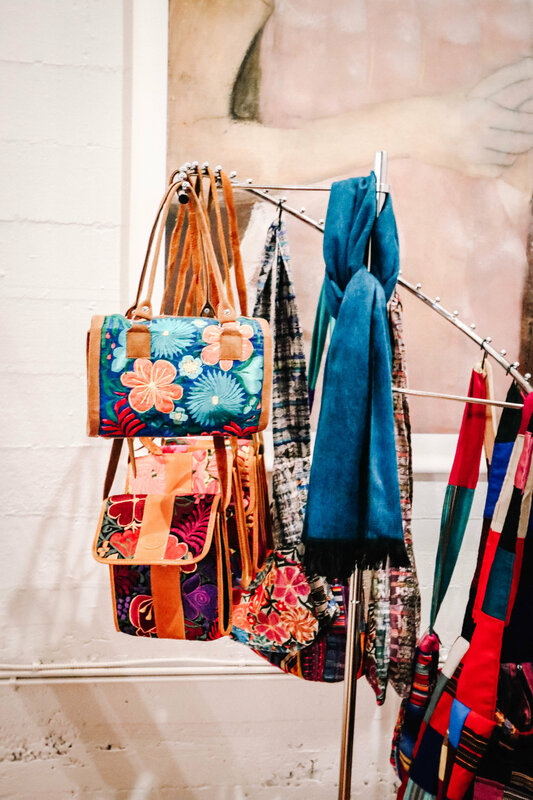 Some of their beautiful hand woven and naturally dyed bags, jewelry and home decor will also be available for purchase in the marketplace prior to the runway show. - HELP COMBAT CLIMATE CHANGE AND PROTECT RAINFORESTS IN YOUR NAME. Each guest will have the opportunity to purchase and protect pristine Amazon rainforest and be part of the land management plan with Hoja Nueva 501(C)(3). This will provide as a buffer zone for indigenous communities, life-long habitat for endangered wildlife, and healthier lungs for our planet. 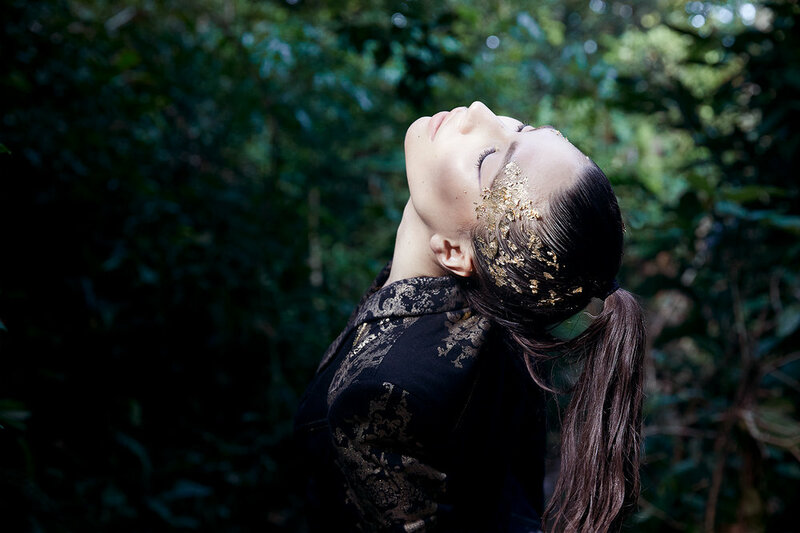 - WITNESS THE RAINFOREST RUNWAY. 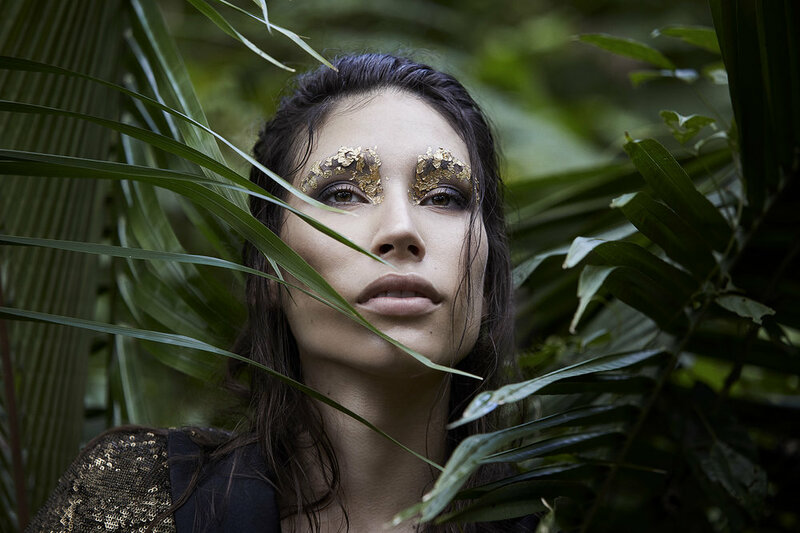 As seen in vogue and previewed at London Fashion Week: witness 6 stunning international runway shows, lively dance performances, eclectic sounds of the wild and other forms of visual art—all inspired by the richly diverse rainforests of the world! - WEAR THAT DRESS/SUIT YOU HAVEN’T. We hear so many complaints about there not being enough events in Seattle to dress up for. Here is your opportunity, we can’t wait to see what wild and wonderful attire in which you adorn yourselves! Tickets are limited to 300 guests, so get them before it’s too late! *Ticket prices increase at the end of August. **All ticket levels are 100% tax deductible. 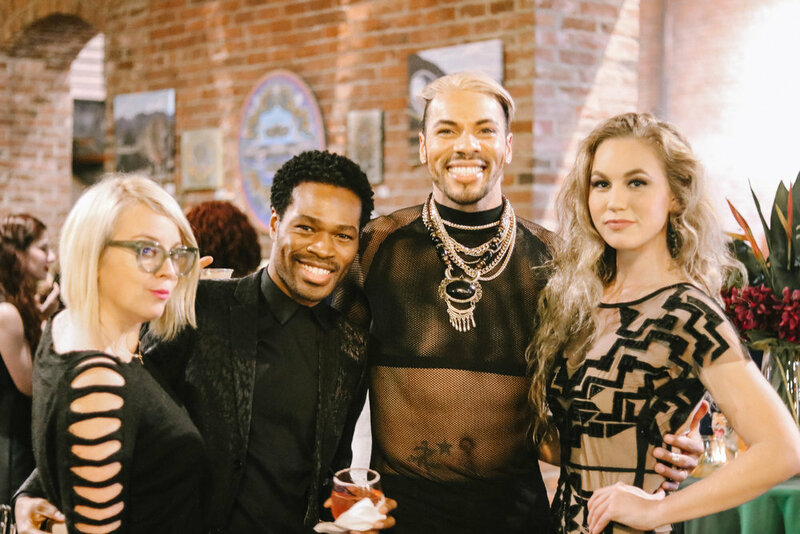 Our Cocktails for Conservation event had fresh new faces out to support both the mission of Fashion for Conservation (FFC), and honoring the conservation efforts of 501 (c)(3) non-profit Hoja Nueva. 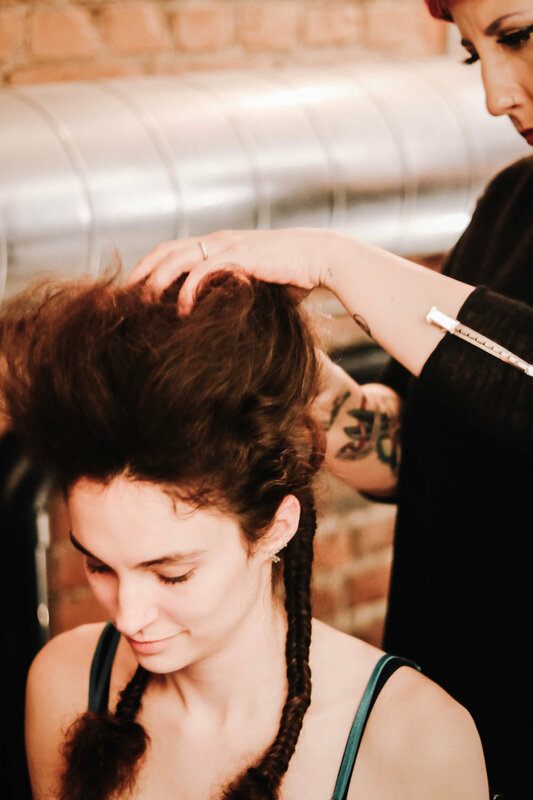 The event was held at the Capitol Hill location of the Riveter. The small aesthetic details of the venue mixed well with the amazonian theme of the night, even down to the herbal cocktails. What made it all special? A speech given by both FFC founder Ava Holmes as well as Hoja Nueva founder Samantha Zwicker. Samantha's speech was both educational and inspiring, as she went through her presentation of her proud moments with ocelot Khan, her mentorship with her interns and their unique projects at her eco-lodge, or sharing some of the amazing wildlife that populates in her backyard in Peru. Interested in learning more? Find Hoja Nueva's website here for more information. We appreciate our sponsors so much, that come out to our events and provide great experiences for our guests! We had free beauty treatments from Vann Edge and chocolate tasting from Indi Chocolates. We love collaborating with local businesses. If you are interested, we would love to hear from you! Speaking of chocolate, Hoja Nueva practices sustainable agroforestry and cacao production, and cacao is the most sustainable crop in Peru. The history of cacao cultivation is thousands of years old in that particular area! To learn more about cacao and Hoja Nueva's plans for future permaculture projects, visit here. Enjoy some more snapshots of the night below! Special thanks to Janice Cabrera for DJ services, KIND, Belanof, LOLA, GTS Kombucha, Vann Edge Salon, Microsoft, and Indi Chocolates for contributing to a wonderful night! What would a fashion event be without a mini photoshoot? We had three lovely models (Marie Johansen, Yuliana Kelley, and Andria Liann) supporting the cause, and weaving through the crowd throughout the party. Makeup for the night was done by Francesca Belgrano. 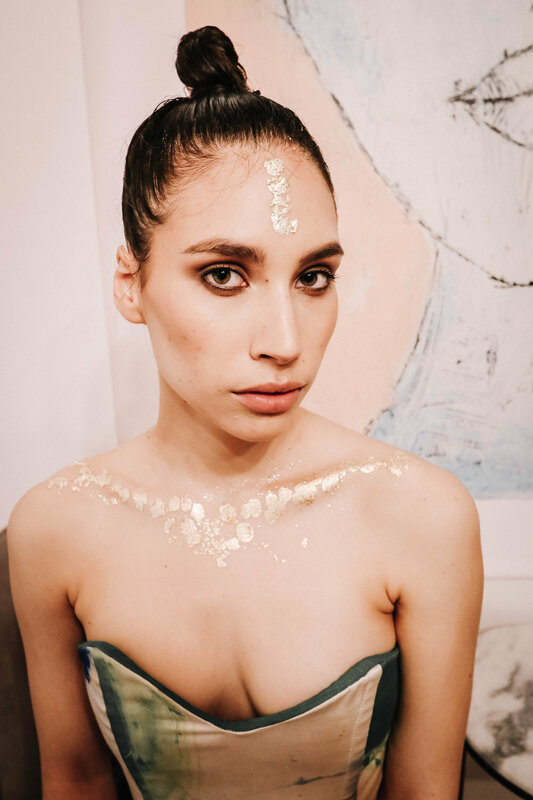 The gold details of the face and body makeup created a stunning finish! We truly believe in the bridging of fashion and conservation, and partnering with Hoja Nueva has been eye-opening for what we can do to contribute to conservation on a larger scale. We as individuals, consumers in the fashion industry, have the ability to make very important, sustainable decisions. By focusing on the Amazon Rainforest specifically, we can make big changes towards stopping deforestation, which threatens entire ecosystems. Sharing and spreading the word in even the community of Seattle is an amazing start! A big thank you to everyone that attended Wednesday's event, and we hope to see you all at the Fashion for Conservation gala in September! Kelly is a lifestyle blogger based out of Seattle, Washington. She has her own website kstateofmind.com. She currently blogs her personal style, travel adventures, and health tips. Being a former collegiate tennis player and public health major, Kelly loves to get involved with a variety of collaborations, not excluding her lead blogger role with Fashion for Conservation. 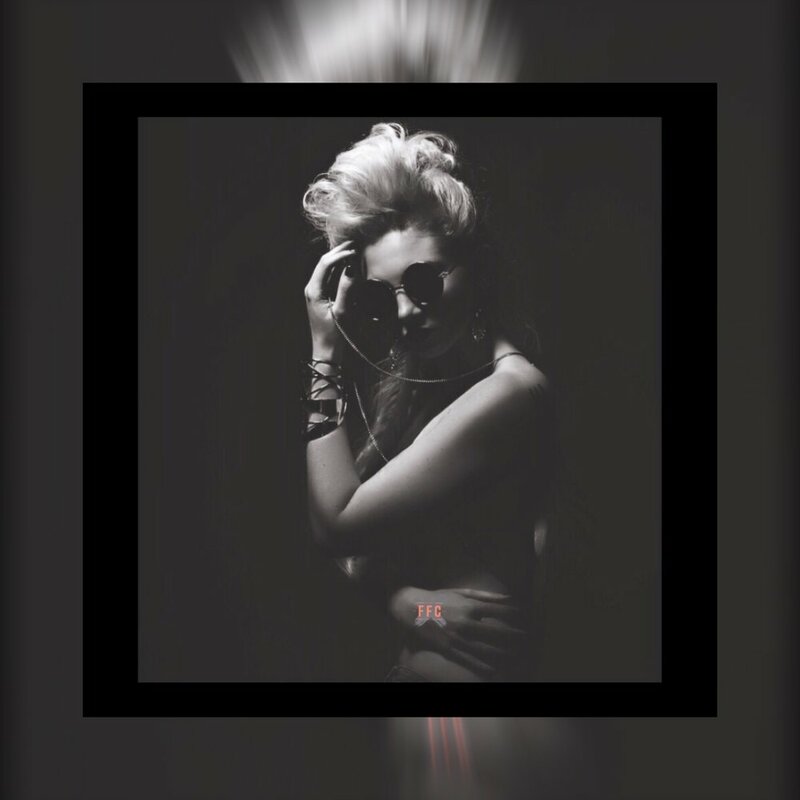 She utilizes her passions for photography and writing for her freelance work and creative drive. Fashion for Conservation is excited to announce our Cocktails for Conservation event this Wednesday the 30th, at 7:30 pm. The venue is the Riveter in Capitol Hill, an exciting new collaboration for us in the Seattle area. Our cocktails event will be hosted by Fashion for Conservation, and will be benefitting 501 (c)(3) non-profit Hoja Nueva, with an included speech from its founder Samantha Zwicker. There will be chocolate and cacao tasting by Indi Chocolates, local and international artisans showcasing their work, and Amazonian inspired specialty cocktails by Root Kin Remedy. There will also be free beauty treatments provided by Vann Edge Salon. 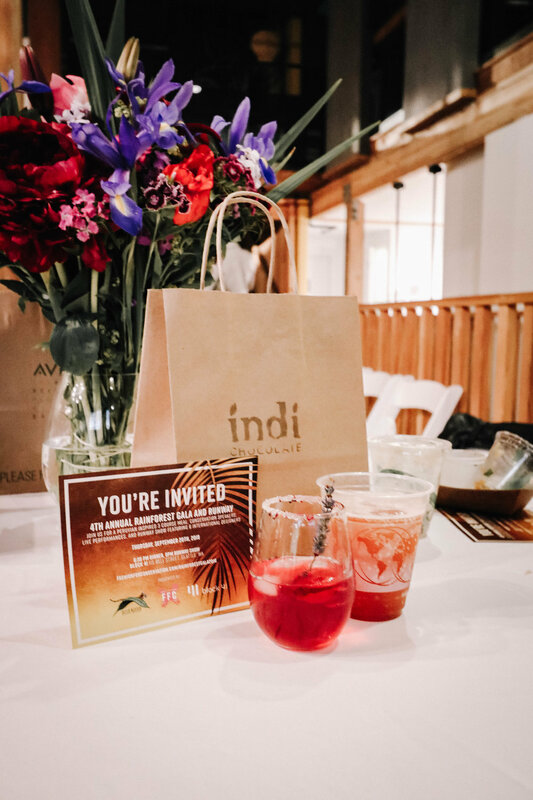 This event is one of many to introduce the goal of bridging concrete and Amazonian jungles with representatives from Amazon Inc., Vann Edge, Fashion for Conservation and Hoja Nueva. 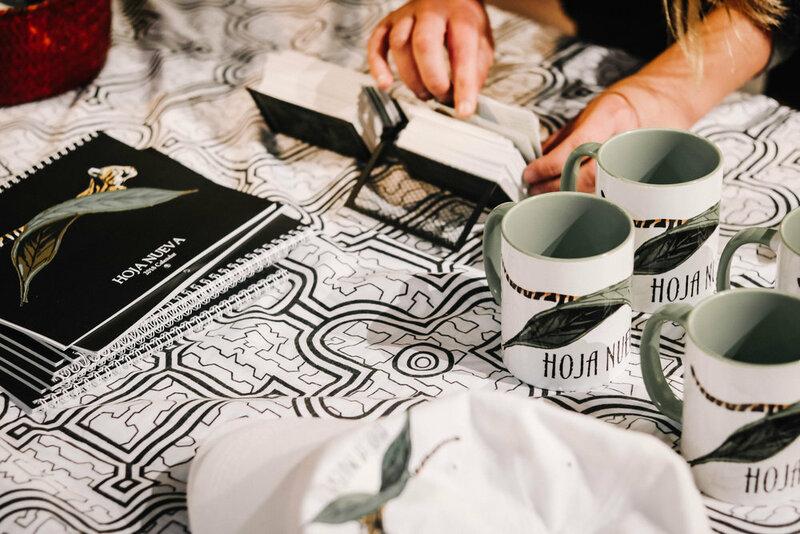 Both Fashion for Conservation and Hoja Nueva's domestic base is Seattle, and we are aiming to spread the word and expand our mission starting here in our home city. We want to educate the Seattle community on sustainability development, eco-fashion, and conservation as well as celebrate with the community as we reach our milestones. Is there a theme or dress code to the event? We aim for business casual, or in other words, authentically fabulous. As for our theme, the night will be inspired by the Amazon jungle, to showcase the conservation efforts at the Hoja Nueva eco-lodge in the Madre de Dios region in Peru. Will a new fashion line be premiered at the event? 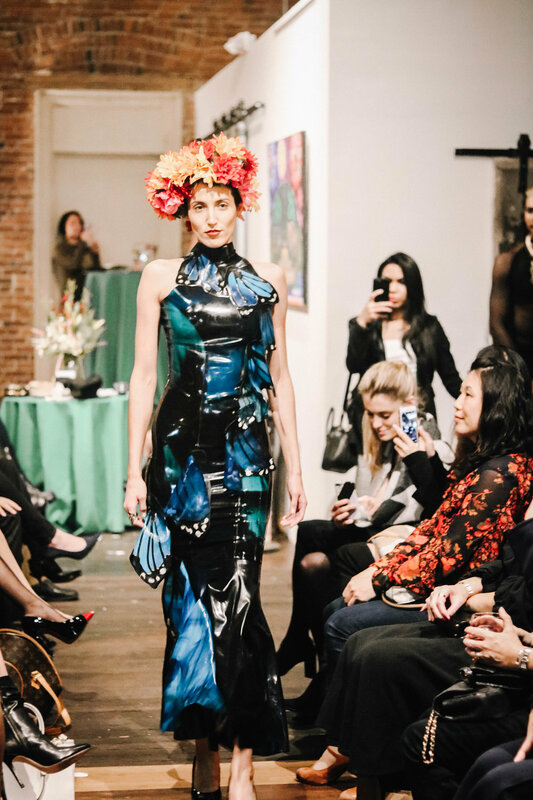 Fashion for Conservation’s 4th Annual Rainforest Gala (that will be held in September 2018) will feature six international designers inspired by the Amazon. The event will be an announcement and pre-celebration of who these designers will be. How exciting! Join us for a night of collaboration, inspiration, and education on conservation efforts and future events with Fashion for Conservation. We hope to see you there! We are three days away from our November 28th event, Cocktails for Conservation. The non-profit benefitted at the event will be Hoja Nueva, which is based out of the remote Piedras region of Madre De Dios, Peru. Samantha Zwicker, the executive director of Hoja Nueva, will be speaking at the event as well. Samantha is a PhD student and current global health scholar here most days, and other days she is trekking through the Peruvian Amazon camera trapping jaguars, treating dogs, or working in the sustainable development of remote, impoverished communities. Her work with Hoja Nueva is very diverse and covers a wide range of health and environmental topics. When Samantha is home you can find her off exploring with her dog Copper in the Pacific Northwest, or spending time with her family. "My love for animals and nature is what guides me," says Samantha, "and continuing to provide a voice for the people and animals that go unheard." Samantha aim to be a sort of global leader, inspiring others to make a difference and help much needed communities around the world. This drive to help created the idea of Hoja Nueva, a U.S 501 (c)(3) nonprofit organization. Samantha began working in the lower Peruvian Amazon almost five years ago, drawn to the frontier forests within the controversial region of Madre De Dios, known globally for illegal mining and logging operations. The interoceanic highway was the last straw - a vast expanse of concrete stretching from the ports of Peru to the ports of Brazil brought an influx of people to corners of the Amazon that have never been reached before. Like other areas of the world opened up by roads, the interoceanic highway led to the creation of thousands of more roads for logging, agriculture, and settlement. For migrants in search of free land and a better future for their children, the unprotected forests of Las Piedras, albeit viewed as untamed jungle, were a blessing. The deforestation and habitat destruction incurred over the past six years however, has been detrimental for the future survival of wildlife and rainforest. 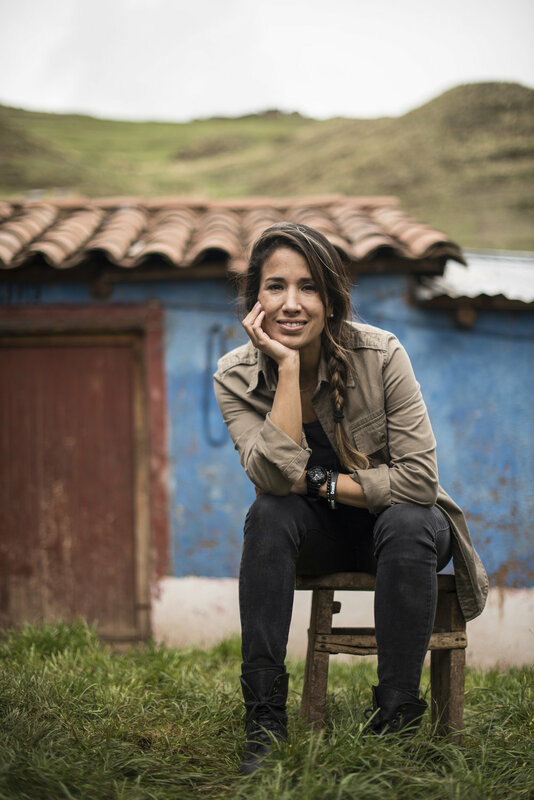 "We started Hoja Nueva as a grassroots organization," Samantha says, "to raise standards of living in impoverished communities while maintaining healthy rainforest habitat." Samantha and the Hoja Nueva team aim to effects change at a local scale, for the lives of people in both migrant and native communities. What is so commonly misunderstood is that these people are vital to rainforest conservation, therefore they must be constantly prioritized in research and conservation projects. Sustainability projects have become very important to Hoja Nueva's recent initiatives, or in other words, guiding Peruvian communities to thrive and develop in a sustainable way. Some of these projects include native communities gaining legal rights to their lands, and creating microfinance programs and alternative income opportunities. Developing waste management and water quality projects, linking sustainable cocoa producers with buyers in the U.S., and bringing students and experts from around the world to educate support in the ways that they can, are very clear goals for Hoja Nueva. To reach their conservation and research goals, Hoja Nueva raised $60,000 in 2015 and 2016 to build a research station and eco-lodge, as well as buy 150-acre plot of land within one of the largest destructive agricultural communities in the Piedras region. Although Hoja Nueva has made great leaps since its founding, Samantha recognizes that are always limitations and obstacles when working in a nonprofit. "We find ourselves consistently faced with issues - big and small - that we want to confront and work on but we do not have the funds," she claims, "One of the most difficult parts about running a nonprofit that is needs-based is not always being able to help." Hoja Nueva goes through periods of getting significant donations and funds to aid projects, and then there are also equal periods of time when Hoja Nueva struggles to make ends meet. It takes a lot of well though out distribution of funds and saving to keep the projects going, as Samantha has already experienced in her dedication to Hoja Nueva so far. "It is not always easy, but in the end it is always worth it," she says. It is only with the help of donors that Hoja Nueva is able to continue their ongoing efforts and implement new ones. Some of their largest, most impactful projects will begin in January of 2018- but you will have to wait for either Cocktails for Conservation or our Third Annual Luncheon to hear about them! 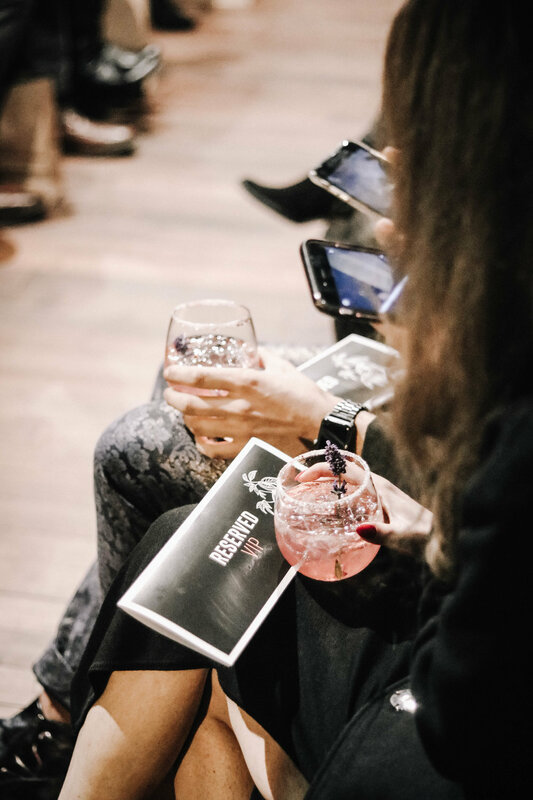 Local events, such as Cocktails for Conservation, spread awareness in a very effective way, through networking and creative stimulus of additions such as eco-fashion. This brings in Hoja Nueva's partnership with Fashion For Conservation (FFC), one Samantha is very proud to continue. Hosting events with FFC spreads awareness of Hoja Nueva's efforts to a consumer crowd, which is crucial and hard to reach solely with Hoja Nueva's media efforts. "The fashion industry is the third most destructive on Earth, " Samantha claims, "especially as it relates to dies, cotton, and an uncanny amount of waste." The truth of the matter is, millions of people tune or attend events such as London or New York Fashion Week. Addressing this audience with issues that have erupted in the tropics and the world in general can make a monumental impact for Hoja Nueva's cause. Not to mention that partnerships like these are a statement for future conservation efforts. Samantha is very excited to speak about Hoja Nueva on November 28th at Cocktails for Conservation, held at Axis in Pioneer Square. By living part of the year in both Peru and Seattle, Samantha stresses the importance of connecting with people and building networking for conservation projects. 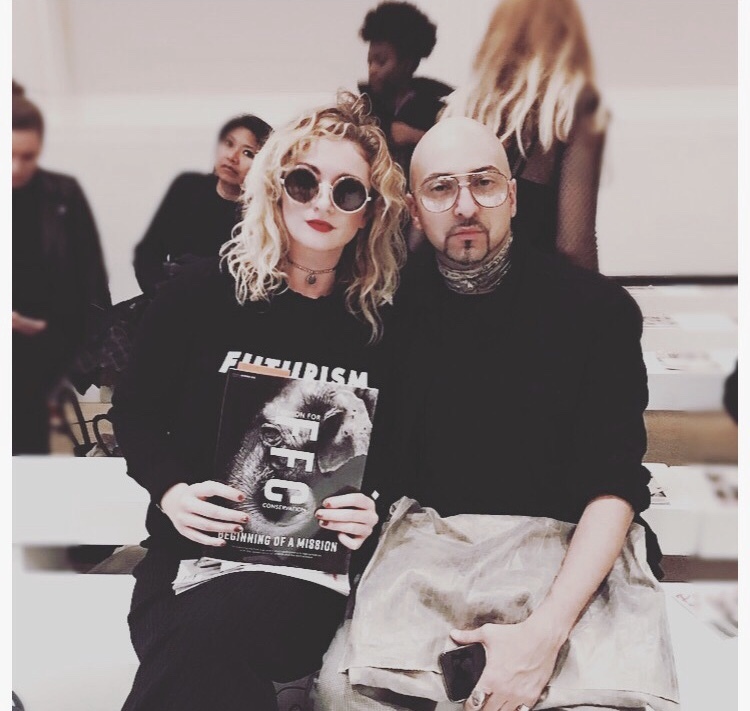 The topics of climate change, loss of biodiversity and wildlife species may have a new chance to gain awareness in the world of fashion, with the help of volunteers and those willing to put in a helping hand with education and promotion. I hope to see you all on November 28th! Why attend this event? Because the merging of fashion and conservation will be fun, educational, and inspiring. There will be stunning fashion, amazing guest speakers, and everything down to the cocktails will be rainforest themed. Fashion and Conservation could have an amazing future in their niche combination, a whole new priority in the fashion industry. Continuing local events lead to larger projects, which sparks a MUCH larger movement. Are you ready to join? I will be in attendance, taking behind the scenes photography and hosting interviews. I would love to meet anyone that would like to attend, and support the benefited cause, Hoja Nueva. Hoja Nueva is based out of Peru, where the founder and executive director, Samantha Zwicker, lives and does research on wildlife inhabiting Peru’s lowland Amazon rainforest. Their current projects cover the topics of wildlife conservation, ecology, global health and community development. Pictured: Khan the Ocelot, who was to be re-entered into the wild by Hoja Nueva member Harry Turner. Khan was killed by a poacher trap, and his memory drives Hoja Nueva to succeed with conservation efforts, despite resistance. There is an important theme of the partnership of Hoja Nueva with FFC. Hoja Nueva’s efforts are put towards a future where humans and wildlife can coexist together. A world where wildlife is not at the expense of human activity. Sustainability should not just be a trend, it should be a lifestyle people adapt to. It should be prioritized. As for making sustainability trendy? This event is up to the challenge. 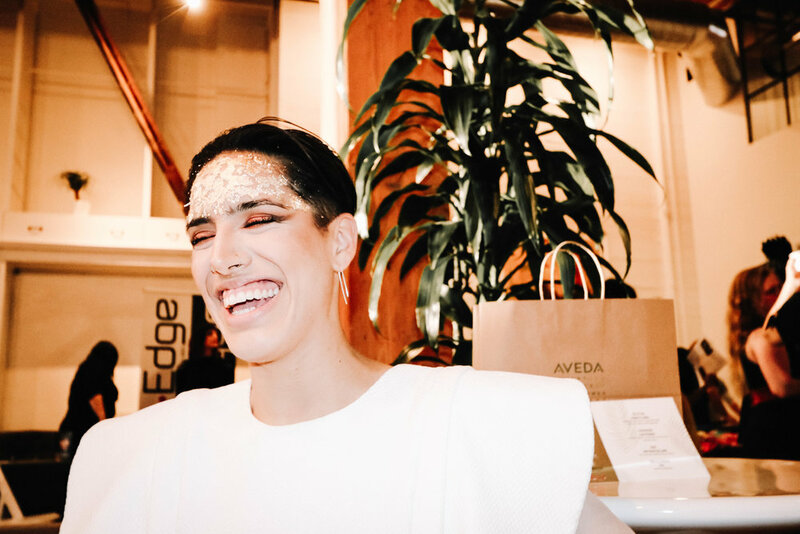 The evening features themed cocktails, fashion design inspired by elephants and rainforests, holiday pop-up shops, keynotes with jungle-dwelling Fashion for Conservation co-founder and Hoja Nueva president Samantha Zwicker, chocolate tastings, and even chair massages! Mark your calendars for this exclusive event with Fashion for Conservation (FFC) taking place on Giving Tuesday, November 28th @ Axis Pioneer Square Seattle. CHOCOLATE: We are very happy to announce Endangered Species Chocolate as one of our sponsors for our goodie bags for VIP guests at Cocktails for Conservation. Endangered Species Chocolate, the makers of the country’s top rated non-GMO and Fair Trade chocolate indulgences, does more than make delicious treats. Their 10% Give Back program has been able to provide nearly $1.4 million to their conservation partners over the past three years. Currently partnering with Wildlife Conservation Network and Rainforest Trust, ESC will be celebrating their 25th anniversary in 2018, and have begun work to broaden their reach and efforts to support each of these great organizations through crafting premium chocolate. 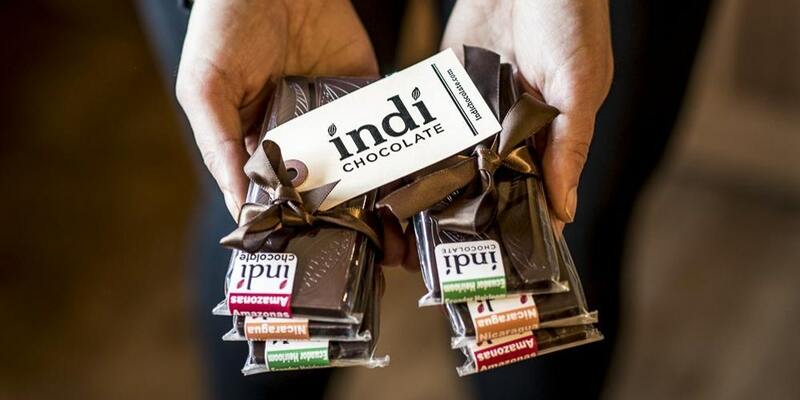 Indi Chocolates Seattle is also making bean to bar chocolate using the FIRST EVER cacao beans sustainably grown at Hoja Nueva. Complimentary chocolate made fresh on-site with Hoja Nueva cacao will be for everyone's enjoyment. 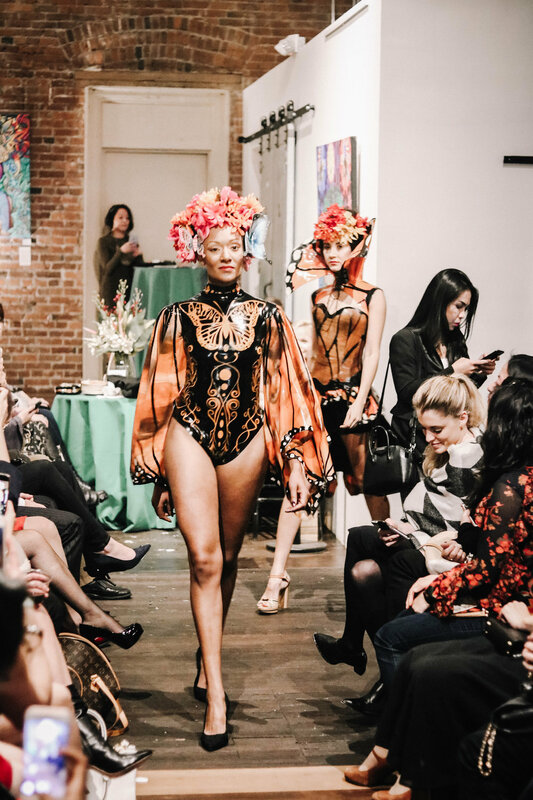 Cocktails for Conservation presents both the full Elephantasia show from London Fashion Week and a preview the Seattle Rainforest Gala 2018! Hoja Nueva executive director, Samantha Zwicker will also share the full circle impact of last year's event, and goals for 2018. ENTERTAINMENT: For the entertainment, in addition to rainforest and elephant themed fashion we are thrilled to have J-NASTY, (Janice Ibarra). Janice is an emerging DJ, stylist, yoga teacher, and co-founder of Women.Weed.WiFi, which is an art collective-movement. Janice feels a strong connection with nature that she harnesses for her activities and lifestyle. The rainforest has taught her awareness. 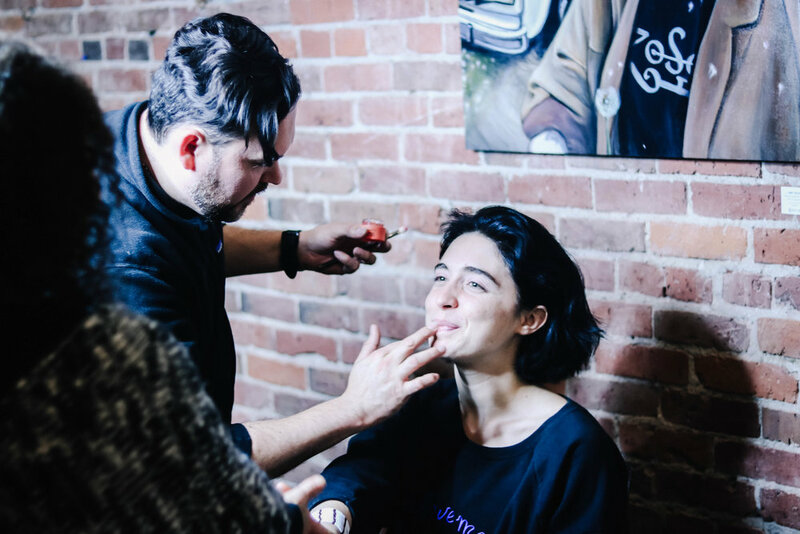 There’s a necessity for growth and change that we are responsible for initiating, and Janice loves to participate in events that get her involved with this change. 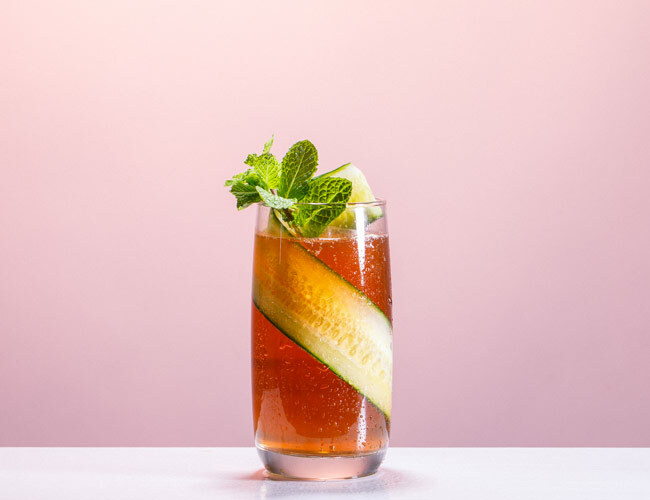 COCKTAILS AND DRINKS: The Seattle Herbalist will be crafting two specialty cocktails with 7 Par Vodka: one will be a floral infusion of rose, lavender, hawthorne, and citrus, and another with root-bitters and cacao. There will also be local organic hard cider by Finn River Farms. The Fashion for Conservation team hopes to see you on November 28th!! 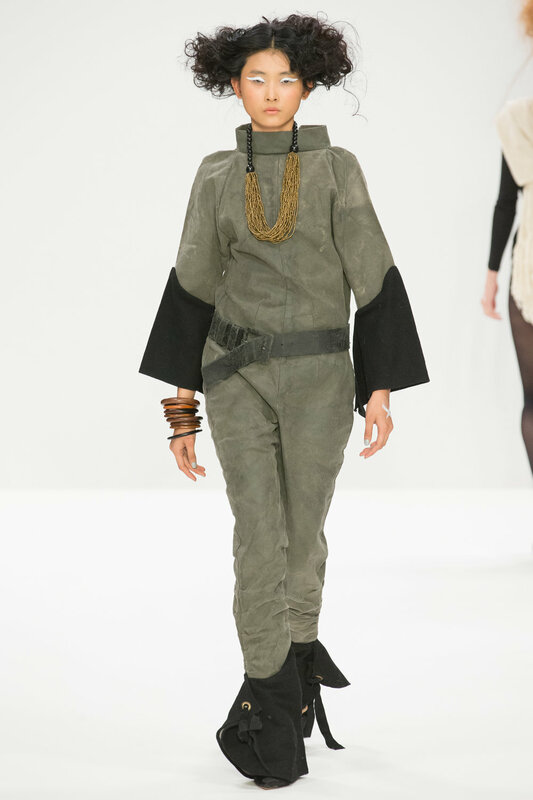 GRIELA PEREZ (One of twelve featured Peruvian designers in last year's Runway to Save the Rainforest). Griela Perez is a Peruvian fashion designer and owner of Las Polleras de Agus, one may ask what a pollera is. Well, a pollera is a one-piece skirt used mostly in traditional festivities and folklore throughout Spanish-speaking Latin America. Polleras are made from materials, such as cotton or wool and tend to have colorful decorations. For the most part, the decorations are embroidered, flowers and regional animals are among the most common designs found in polleras. During the Spanish colonization between 16th and 17th centuries, hacienda owners or hacendados enforced the indigenous population in the Andes to wear them. Traditional polleras come from peasant dress from southern Spanish regions, like Andalusia. Today, polleras are associated with indigenous and folkloric forms of dress. “Las Polleras de Agus is a mix of respect, passion and admiration for our cultural identity. We seek to reclaim our traditional garments which are being lost over time. By incorporating them into contemporary fashion, we create a versatile line. A. Trying to rescue an ancient art that is called the maquinasca, which is a Quechua word that means painting with threads (the art of embroidery). It is a sustainable fashion. Spanish: Tratando de rescatar un arte milenario que se llama la maquinasca palabra Quechua que significa pintar con hilos (el arte del bordado). Es una moda sostenible. A. I live in Cusco Peru. Spanish: Vivo en e Cusco Perú. Q. What first inspired your jungle themed line? Can people still buy it and if so Where can people buy it if they wanted to? What about the jungle inspires you? GRIELA PEREZ DESIGNS "Las Polleras de Agus"
A. What inspired me was the history behind this art because at the beginning it was only the use of the clothes because they looked nice. This was something that came to me because I wanted to put it on my daughter. Then I started to know through the embroiderers that this art and others are being lost. Obviously, that's when I fully commit myself to learning what lies behind this art. Spanish: Lo que me inspiró es todo lo que hay detrás de este arte porque al inicio fué solamente el uso de las prendas porque se veían bonitas. Esto era algo mío porque quería ponérselo a mi hija. Después empecé a conocer por medio de los bordadores que se está perdiendo este arte y demás. Obviamente, ahí es cuando me comprometo totalmente a aprender lo que hay atrás de este art. Q. Do you still have that line on sale or are you designing something new? A. What we are doing is innovating because you know that when something is very repetitive it becomes massive and ours is super exclusive and we always try to create other things. Spanish: Lo que estamos haciendo es innovar porque tú sabes que cuando algo es muy repetitivo viene a ser masivo y lo nuestro es super exclusivo y tratamos siempre de crear otras cosas. Q. What is that thing that inspires from the jungle? A. I love everything organic, everything that has movement and obviously the jungle is life and that's what inspires me. Spanish: A mí me encanta todo lo orgánico, todo lo que tiene movimiento y obviamente la selva es vida y es en eso en lo que me inspiro. Q. Why is conservation important to your brand? A. It is very important because 1. We advocate to rescue a thousand-years old art that is being lost and 2. (Because we conserve) We make sustainable workshops that give work to the community. We make their own community to develop. Everywhere there is the theme of conservation and how to preserve this ancient art. That way, we can help the embroiderers who live in the there because they are the ones who embroider our garments. What we want is for them to grow and not have to go to the cities but to increase their own communities and contribute to sustainability. Spanish: Es muy importante porque 1. nosotros nos advocamos en rescatar un arte milenario que se está perdiendo y 2. (porque conservar) hacemos talleres sostenibles que dan trabajo a la comunidad. Hacemos que se desarrolle su propia comunidad. Por todos lados hay el tema de la conservación y como conservar este arte milenario. De esa manera, podemos ayudar a los bordadores que viven allí porque ellos son los que bordan nuestras prendas. Lo que queremos es que crezcan y no tengan que salir a las ciudades sino que hagan crecer sus propias comunidades y contribuir a la sostenibilidad. Q. How is nature important to you personally from childhood, personal stories or memories you want to share here? A. Nature is important to me because we came from i. If we do not care, what future awaits us? Spanish: La naturaleza es importante para mí porque de allí venimos. Si nosotros no la cuidamos que futuro nos espera. Q. Do you have any anecdote from when you were a child or personal that you would like to share? A. I grew up in the Andes. I am from Cusco by birth and it is definitely such a different life that nature gives you. We are so far from all that is technology and modernity that it makes more human. I have the blessing to continue living here in a place where still five minutes away you find nature. I love that my 3 year old daughter enjoys nature. She has been my muse because this brand came out thanks to her when I put the first garment on he. Spanish: Yo crecí en los Andes. Yo soy cusqueña de nacimiento y definitivamente es una vida tan distinta la que te brinda la naturaleza, tan alejada de todo lo que es tecnología y modernidad lo que te hace más humano. Tengo la bendición de seguir viviendo aquí en un lugar donde todavía a cinco minutos encuentras naturaleza. Me encanta que mi hija de 3 años disfrutar tanto de la naturaleza. Ella ha sido mi musa porque esta marca empezó gracias a ella cuando le puse la primera prenda. Q. What are you most excited about with your brand this coming season? A. We have gone little by little but the goal that we have always had since this project was created is to create an association so that the people who are really the participants and those who make your clothes can acquire many benefits like health, access to technology, etc.. Obviously, in these places you need to implement technology to be able to give them a tablet or computer so they can see the designs they are going to embroider. For me, that has been a great achievement because we are already creating the association and this is one of the goals that the brand has. In Peru a wave has been awakened that I think I have had a lot to do with because now it is a trend to wear polleras. We have changed that western influence of using things that comes from outside (from abroad) and use what is ours. Spanish: Hemos ido poco a poco pero la meta que hemos tenido siempre desde que se creo este proyecto es crear una asociación para que la gente que son realmente los partícipes y los que hacen tu ropa puedan adquirir muchos beneficios como salud, acceso a la tecnología, etc. Obviamente, en estos lugares se necesita implantar la tecnología para poderles darle un tablet ó computadora para que puedan ver dan los diseños que van a bordar. Para mí eso ha sido un gran logro porque ya estamos creando la asociación y esto es uno de las metas que tiene la marca. En Perú se ha despertado una ola que creo que yo he tenido mucho que ver porque ahora es tendencia el uso de las polleras. Nosotros hemos cambiado esa influencia occidental de usar cosas que viene de afuera (del extranjero) y usar lo nuestro. Q. 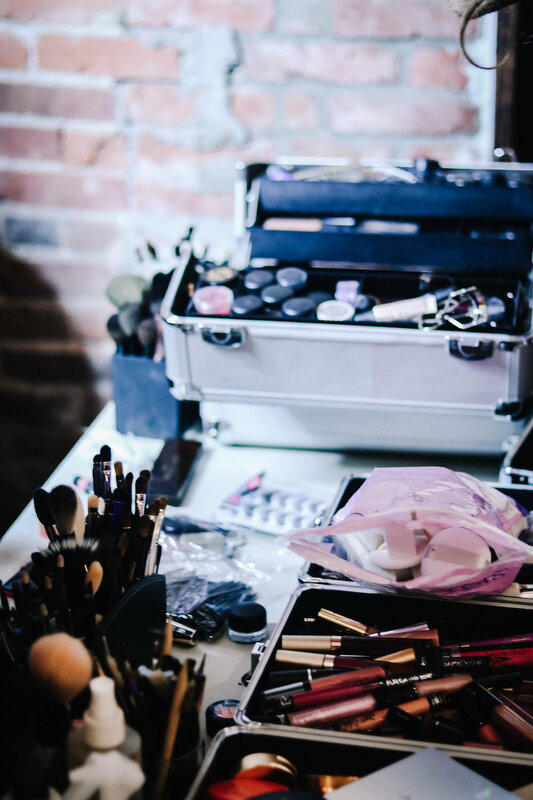 What was your favourite moment about being a part of runway to Peru last year? A. The moment I entered the backstage and saw that there were other super interesting brands from Peru and see me there around people so important, because we just started, was the most beautiful experience to me. Seeing what happens in the backstage is beautiful. I remember when I came in and was a little scared, I said to myself "I can do this". This project is very exciting and I see it in the followers of Instagram and Facebook when we publish something there are lots os hearts. This is becoming a love brand and I think we are on track. Spanish: El momento que entré al backstage y ví que habían otras marcas super interesantes de Perú y verme ahí alrededor de gente tan importante, porque nosotros recién empezábamos, ha sido la experiencia más linda. Ver lo que pasa en el entre bastidores es hermoso. Me acuerdo de cuando entré y tenía un poco de miedo, y me díje "yo si puedo". Este proyecto es muy apasionante y lo veo en los seguidores de Instagram y Facebook cuando publicamos algo hay muchos corazones. Esto se está convirtiendo en un love mark y creo que vamos en buen camino. A. I would love for them to be inspired by the Andes. Fashion for Conservation has as much to give as the theme of the jungle but we also have the Andes, which are so cold and forgotten but it is so cute and has so much color. When you travel to these little towns and you see that everything is so dry, cold and there is no vegetation but suddenly a person full of color appears it is as if life comes back to you. Spanish: Me encantaría que se inspiren en los Andes. Fashion for Conservation tiene tanto que dar como el tema de la selva pero también tenemos los Andes que son tan fríos y olvidados pero es tan lindo y tiene tanto color. Cuando viajas a estos pueblitos y ves que todo es tan seco, frío y no hay vegetación pero de pronto aparece una persona llena de color y es como te vuelve la vida. JUNE 9TH 2018 - SEATTLE RAINFOREST GALA! SDG5 FT. TOUGO COFFEE CO.